The League of Pissed-Off Voters is, well, pissed off about Mayor Ed Lee’s lighthearted tone in his “Be Nice, Look Twice” campaign — his answer to the maiming and killing of San Franciscans by reckless drivers. 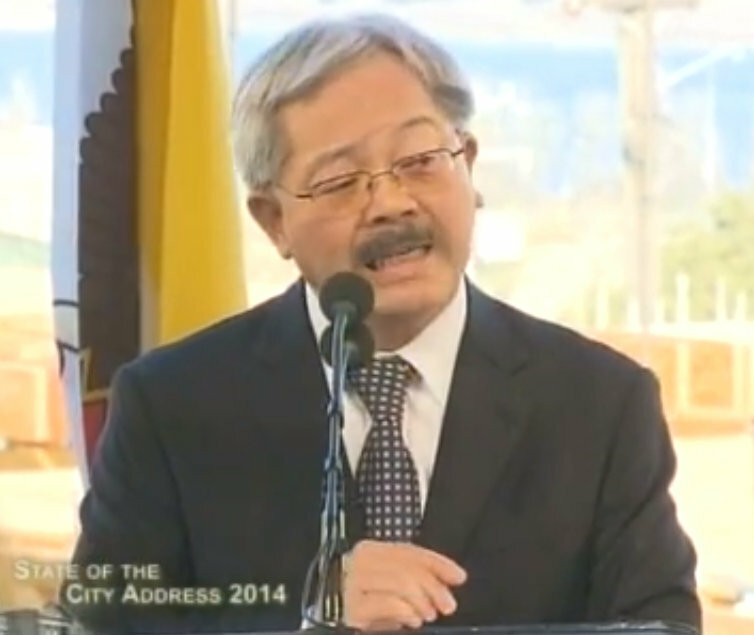 Mayor Lee at his “State of the City” address last week. A cute rhyming slogan is not only worthless, it is deeply offensive to the hundreds of victims of traffic violence and shows that the Mayor is clearly not taking this issue seriously. Imagine how the you would react if Mayor Lee proposed a plan to reduce gun violence with a Public Service Campaign called “Give a Hoot, Don’t Shoot.” We need leadership from the Mayor – not pandering to the vehicular class. Will you join the rest of the city and call for zero deaths in the next ten years? And will you prioritize the funding in your budget to get the engineering, education and enforcement necessary to save lives? It WOULD be nice, wouldn’t it, to not have to worry about getting killed every time you step into a crosswalk on a green light. Note the difference between the city’s message to drivers and what it tells pedestrians. While drivers are asked to “be nice” and not run people over, pedestrians get flyers from SFPD depicting a body lying on the street, alongside the words, “It’s of little comfort to know you had the right of way, while you recover from serious injury in the hospital.” How nice. Unrelated, but has anyone at SF Streetsblog heard about an accident Friday night (1/24) at 30th and Mission. The bus shelter on the NE corner shows signs of a serious collision with a vehicle. One of the corner posts and narrower sides was knocked over. The shelter was wrapped in yellow tape and flowers were left in an orange cone. Seems like a pedestrian may have been injured. Lee’s communiqués are dismissive in tone and misdirected, but not totally wrong. The thing is we need two messages for different audiences. The problem is that only the first slogan is true today, which makes it a convenient cop-out. Mayor Lee still doesn’t see the assymetry. Or just doesn’t care. For this pedestrian hit at a bus shelter, it doesn’t sound like “looking twice” would have helped much, or even the pedestrian following the SFPD’s “distracted walking” flyer for that matter. Another example of how the focus needs to be on the drivers. To expect anything more than trite little slogans from “Mayor” Ed Lee is to expect things simply not possible. Why is anyone surprised? “Mayor” Lee gives no flying f*cks about anything but whatever his buddies tell him to do. Muni? Bikes? Pedestrians? He could care less. And, well, he does! He’s really a pretty weak mayor. Out of 800,000+ residents, can’t we find somebody with at least a little more vision, character, and rationality than this guy? 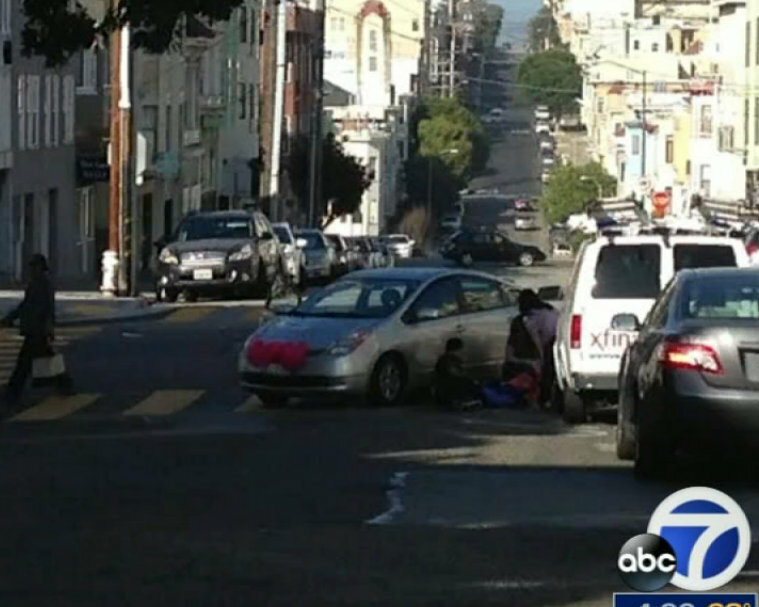 Bus Stops and Crosswalks: Does Mayor Lee Care Where His Car is Parked?